Okay I know it's been forever since I last blogged but I've had a lot going on. Well I guess as you can tell My family & I survived Hurricane Ike. We went 5 days without power. It was so hot. I tell you what that made me appreciate all the things that we have here in this Country a whole lot more. I couldn't imagine living that way my whole life. Well below are a few pictures I took. I stayed at my best friends house during the hurricane, but when it got bad we went to Rancho Viejo (yes you read right) Tony's parents know the owner real well. So we stayed & slept there we tried to atleast. Oh and as for my family they stayed at the First Baptist Church. Please just pray for all the families that have lost their homes and for the families that have lost someone due to Hurricane Ike. That's it for now. Later & God Bless! 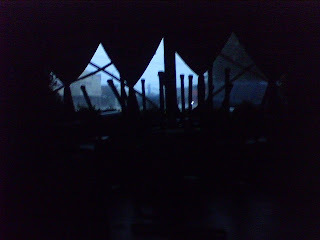 This is what rancho Viejo looks like with no power. This was outside the window in the room I was sleeping in at the Alvarado's house. This one too. I'm glad we got out when we did. It fell in there neighbors yard. This tree is at my house on the road. 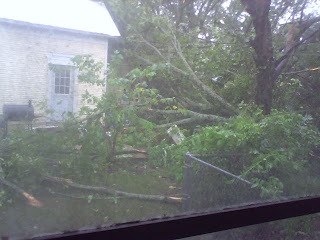 It was crazy because the night before this picture was taken my dad had moved his truck from that area where the tree fell. That was a big 'ol tree. of course Im reading this!!! I've been waiting for you to blog! 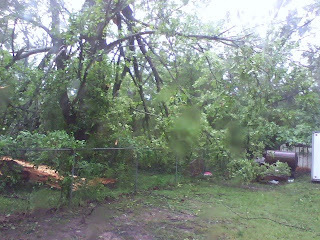 Im glad to hear yall made it ok and that you now have power! So does this mean you have to go back to work?? What about Denise? I've done everything but go knock on her door to try to get ahold of her! Hello my friend!! You would think with me not being there calling you, sametiming you, emailing you...that you would have more time to blog! It's been a week, come on...post something, update me on something..something, anything! Oh, by the way, I MISS YOU!!! I agree that 5 days without power is a pretty interesting predicament, isn't it? Rancho Viejo in the dark! WOW! Yeh but could they still make a killer quesadilla? ! !